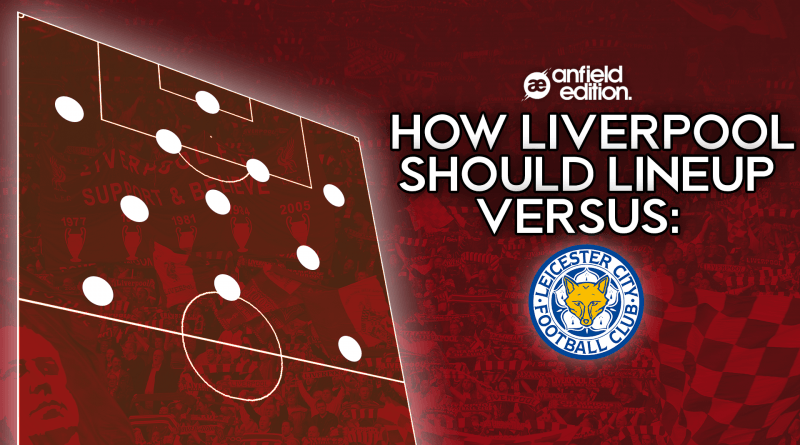 A selected few of the Anfield Edition team have picked their Liverpool XI’s to Leicester City on Saturday. Three clean sheets on the trot means that for me at least, the defence picks itself for the first time in what feels like an eternity. Robertson and Trent encapsulated Klopp’s attacking philosophy with their performances against Brighton and there’s no doubt they will retain their places. It’s hard to suggest any changes to a side that has been near faultless this season, while on paper a midfield of Wijnaldum, Milner and Keita could benefit from the defensive grit of Fabinho or Henderson (especially against a stronger side such as Leicester) as the old saying goes; if it ain’t broke don’t fix it. I expect all three of the aforementioned to retain their places going into this game, despite strongly advocating for Henderson to start previously. However, there could be danger in this approach – in waiting for a problem to emerge before you fix it, it could cost you. However, I have full faith in the manager and the decisions he makes both tactically and based off of performances in training. When all’s said and done, we will likely be unchanged and I have no qualms with that whatsoever. Having said that, I would personally bring in Fabinho. With 3 clean sheets in the same number of games, the back 5 obviously keeps its place against Leicester, with Gomez really establishing himself at centre back and proving he could be a long term option alongside Van Dijk. The only change I’d make would come in midfield. I’d swap Milner for Hendo. While Milner’s done nothing wrong in the first three games — he was exceptional against West Ham, scored a penalty against Palace and was crucial in the goal on Saturday, I think the tempo of the game dropped slightly in the second half against Brighton and a change needs to be made. Wijnaldum has been immense since starting at the base of midfield and he’s undroppable right now. While Keita wasn’t at his best on the weekend, we know what he’s capable of offering from a creative perspective. Henderson helped settle the game versus Brighton and although fans will be clamouring for Fabinho, Klopp’s easing him in gradually, which will be more beneficial in the long run. While Firmino hasn’t really got going this season and neither Salah or Mane were at their very best on Saturday, we know what they’re capable of when they’re in sync and on top form and it would be nonsensical to swap one of them out as they’re arguably the best front three in Europe. Hopefully they’ll all be firing at the King Power. Alisson in goal, already proving his worth, my goodness that little dink over Knockaert, what a bloke. I can’t stress how important it is that he now stays fit all season, nothing seems worse than having Migs in goal, I genuinely would rather have Karius (all his mistakes aside). Defence unchanged because we haven’t actually conceded so far (allez allez allez), Gomez seems to really be blossoming as a CB and especially next to VVD. Midfield has been great, some of you didn’t agree with me last time around when i said Gini was playing as a 6, and he was doing it really well. You only needed to watch the game against Brighton to see how disciplined he was as the holding midfielder, it seems some people have something against Gini and can’t accept he is a really important player for us, the lad is boss. Front three unchanged (what a surprise), Salah can hopefully bag again and Bobby can be at his best linking up play. Mane seemed a bit off at the weekend so if he still is come 70 minutes against Leicester i’d put Shaqiri on the right and bring Salah into the middle with Bobby drifting out left a little. Klopp spoke of potential changes being made to the starting eleven and, despite an unchanged eleven during the opening month of the season wielding three successive victories, I can see alterations being made. I’d expect the midfield to be the only area of rotation this weekend. Keita is an assured starter in my opinion due to the creative threat he possesses in the middle of the park and I think Wijnaldum is undroppable after three top performances in the six position. Although he has also had a brilliant start to the season, as the oldest of the midfield group, I can see James Milner being rested with club captain Jordan Henderson coming in for his first start of the season. The trio up top are yet to hit the frightening heights they did last season, but I would still like to see them all start to try and build back up that chemistry. However, I wouldn’t object to seeing Shaqiri come in to ensure complacency doesn’t kick in. Finally, I think Klopp will stick with the same back five. Being the only team in the Premier League yet to concede a goal, I see no reason to change things.